While you know what you look like, do you know what your nervous system thinks you look like? Read further and learn how your skin's sensitivity changes how you will see your body. In this lab you will get to visualize how your somatosensory (touch) cortex sensitivity varies over certain areas of your body. Experiment: How Your Skin Senses - You should become familiar with how to your skin senses, and how to collect the data required for this lesson. If you take a quarter and run its rough edge from your arm to your hand, the sensation of it changes from smooth to rough. Why is that? Its not like your arm has no nerves, it can sense things (it knows the quarter is there for instance), but its much less sensitive than your hand is. If you place the quarter along your fingertips, for example, you can feel the ridges easily. This is due to how the somatosensory cortex is laid out. To learn more about the somatosensory system, take a look at the How Your Skin Senses experiment. As you can probably sense (pun intended), the somatosensory cortex is organized into a map that corresponds to locations on the body. This map is different than a simple picture of your body. For example, a small portion of cortex is devoted to your arm, while a very large portion is dedicated to your hand and fingers. You might ask why more area is dedicated to the hand when your arm is clearly larger? The answer is simply that your hand is more useful for gathering information than your arm. This is why you can feel such fine detail with your finger tips, such as the head of the penny, rather than on your bicep. This odd map, corresponding body part to touch sensitivity, is called a homunculus, Latin for "little man". This drawing shows that areas of your body are represented disproportionately in the somatosensory cortex, and was discovered in 1950 by Canadian neurosurgeon Dr. Penfield of McGill University. During the 1950's McGill was a very exciting place for neuroscience, and Dr. Penfield operated on epilepsy patients during open brain surgery. While these patients were awake, Dr. Penfield would stimulate certain areas in the somatosensory cortex, and patients would report slight sensations in different parts of their body. 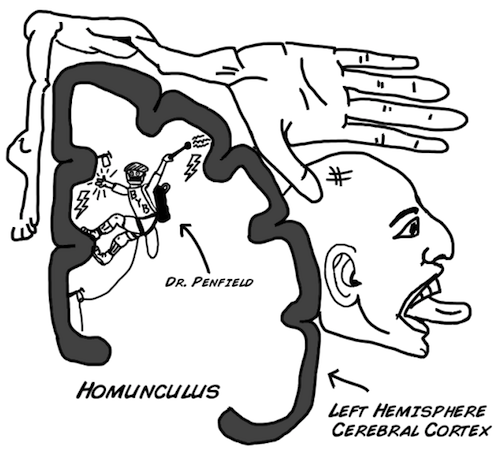 The picture below is of a homunculus, mapped only for the left cerebral hemisphere. It's time to see what your Homunculus would look like as a person! The Max Planck Institute has designed a great website to do just that! Follow the instructions below, and you will see how your somatosensory system looks like according to your nervous system. Add your name, then adjust the settings to be as close to the measurements you wrote down as possible. Once you have made your Homunculus, switch with your partner so they can make their own! Why isn't your skin's sensitivity in proportion to the size of the body part? Is it reversed? How different is your Homunculus from your partner's? Where are they different and where are they the same? What would happen if your skin sensitivity in your hands stopped working?